…und manche träumen immer noch davon, wenn sie schon längst „größere Jungs“ sind. Da trifft es sich hin und wieder gut, wenn ein Fahrzeug- und ein Spielzeughersteller mit dem nötigen Kleingeld kommen und es darauf anlegen, diese Träume auch mal umzusetzen. 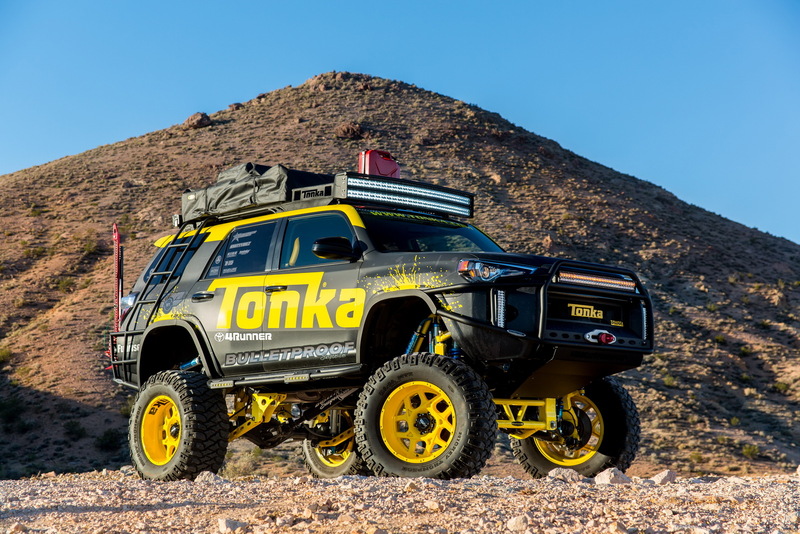 Putting the “Toy” in Toyota—with a capital T—is the purpose of the Tonka 4Runner concept vehicle, which will be on display at Toyota’s 2015 Specialty Equipment Market Association (SEMA) Show booth. 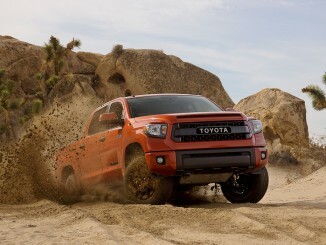 Toyota teamed with Funrise Toy Corporation, manufacturer of Tonka toys for Hasbro, to build a life-size Tonka SUV whose theme is “the ultimate off-road adventure.” The Tonka 4Runner joins the Tonka Tundra fire truck as the latest collaboration between the two iconic brands. 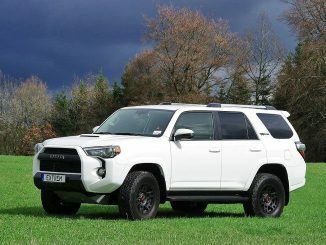 The Tonka 4Runner is powered by the same 4.0-liter V6 as the production 4Runner—but that’s about the only similarity between the two. 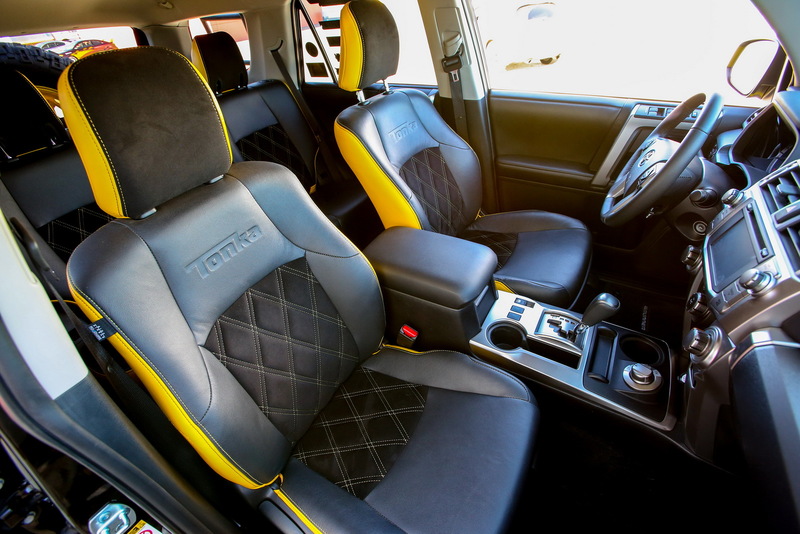 The concept vehicle’s body—elevated to new heights by a ten-inch Bulletproof Suspension lift kit—sports bold matte black and yellow Tonka graphics. Twenty-inch Ultra Motorsports Type 250 Colossus wheels are enveloped by Mickey Thompson Baja MTZ 38×15.50R20LT off-road tires. 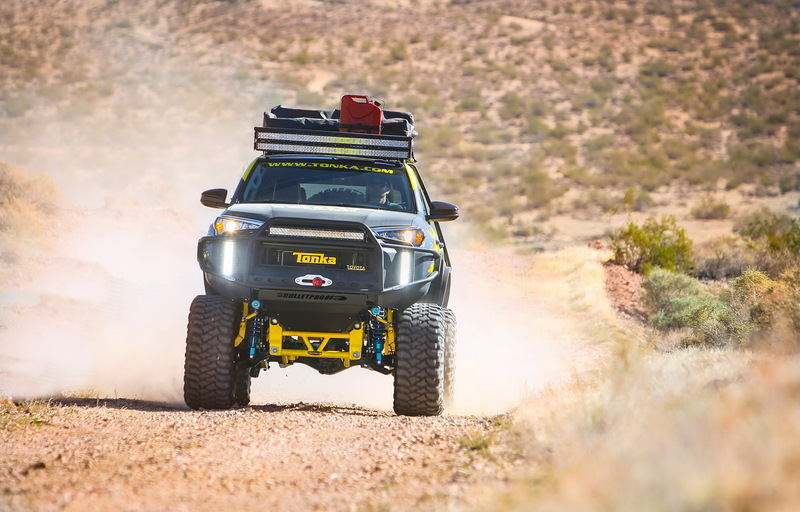 Over each tire are Rigid Industries LED lights, so that the vehicle is as impossible to miss at night as it is in broad daylight. The crowning touch, literally, is the pop-up tent on the Tonka 4Runner’s roof, which makes the SUV the ultimate dream machine for outdoor enthusiasts. 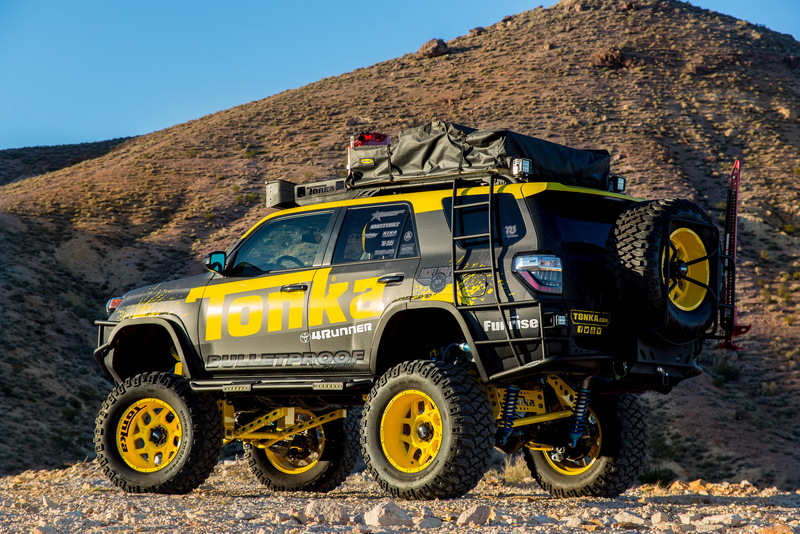 The Tonka 4Runner can be seen November 3-6, 2015, in the Toyota display booth (#24700) located in the Central Hall of the Las Vegas Convention Center at the 2015 SEMA Show.